Our Classic Tube Kits, with their solid brass, flat-topped, knurled caps and natural aluminum bodies, are the sort that used to come standard with any quality cane rod. We’ve made them available again. Over the past many years, more and more makers have come to rely on our tube kits to house their rods with the simple and durable elegance favored by the old masters. 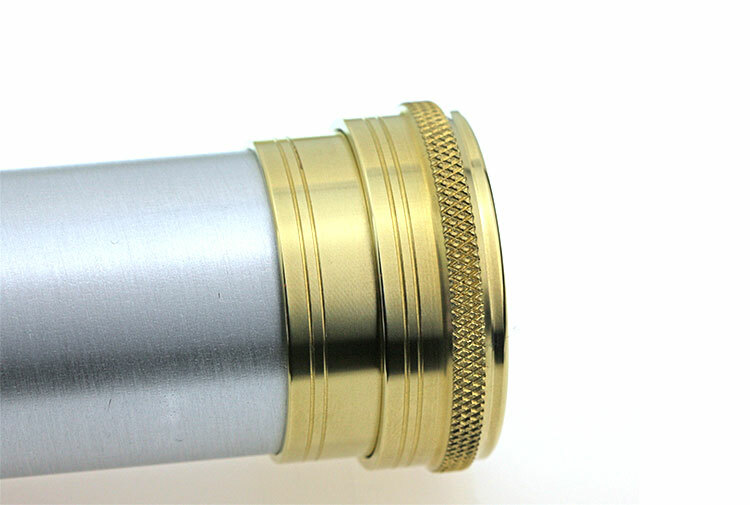 These tubes are the truly classic alternative to the thin-walled, wrinkle-finished tubes with easily scratched, brass-colored, anodized aluminum caps. Our tubes have a wall thickness of about 0.080” vs. the 0.035”-0.050” walls of common tubes. We make them extra heavy to protect your rods from the gentle touch of airline baggage handlers, errant car tires, etc.. The end caps are milled from solid brass: they have heft, they engrave well, and they practically glow if you take the time to polish them. You’ve invested dozens of hours and hundreds of dollars in your rods, so protect them – don’t merely house them. If you collect old rods, use our Classic Tube Kits to re-tube a cherished relic – your local trophy shop can engrave all the pertinent details on the cap for easy reference in your rod rack. The 1-5/8” tube kits are perfect for two-piece flyrods with one or two tips. The 2” tube kits are great for three- and four-piece flyrods as well as spinning and casting rods. We supply easy-to-follow instructions so that you can cut the tube to length and have it assembled in less than 15 or 20 minutes (admittedly, it will take longer if you take the time to sand and/or polish the raw tube). Once the tube is trimmed to length, which you can do on a chop saw with an aluminum cutting blade or by hand with a hack saw, assembly requires no power tools, just a mallet and a dollop of epoxy. When trimming the tube, we strongly recommend that you add 1” to the length of your rod sections to accommodate the rod sack, ferrule plugs, and so forth.